13 ½” X 19” serigraph print. 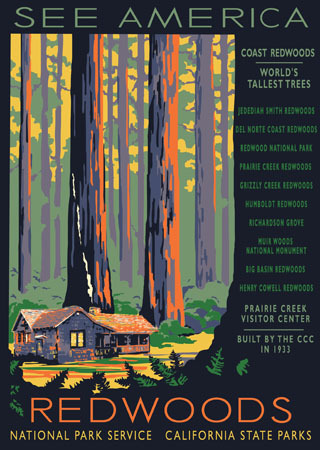 "The Redwoods" are really a system of about 129 NPS and California State Park units and has been added to over the years. The Prairie Creek State Park was formed in the early 1920s largely through the efforts of the Save the Redwoods League after 90% of the standing redwoods were logged. in the 1930s Prairie Creek and Elk Meadows became the home to the Civilian Conservaton Corps' Company 1903 where they built this "concession and recreation" building, now a Visitors Center. I chose a See America theme for this contemporary design due to it's unique and fragmented history. Redwood is also a World Heritage Site and a Biosphere Reserve.